Copyright © 1997 by Hackett Publishing Company, Inc.
associate editor, D. S. Hutchinson. I. Cooper, John M. (John Madison). Names listed are those of the translators. *It is generally agreed by scholars that Plato is not the author of this work. †It is not generally agreed by scholars whether Plato is the author of this work. when Greek philosophy was struggling to maintain itself against Christianity and other eastern ‘wisdoms’, Platonist philosophy was philosophy itself. held it without interruption ever since. (Oxford: Clarendon Press, 1986); for the change of name, see pp. 186–88. 2. Translations of Phaedo and Meno, made in Sicily, were also available from about 1160.
been prepared (V). But first, a few basic facts about Plato’s life and career. grove of Academus, in the Attic countryside near Athens, apparently offering formal instruction in mathematical, philosophical, and political studies. to itself philosophers and mathematicians from all over the Greek world. himself, right up to the time of Plato’s death twenty years later. 1925), dates perhaps from the third century A.D.
4. For the sake of completeness, we also print translations of the short poems (‘Epigrams’) that have come down to us from antiquity with Plato’s name attached. works in Thrasyllus’ tetralogies, but none of the ‘spuria’. private hands, not at all from anything like a modern author’s ‘autograph’. thinks are by Plato or as ones as to which there is no consensus that they are by him. work, see H. Tarrant, Thrasyllan Platonism (Ithaca, N.Y.: Cornell University Press, 1993). he had not finished working on it. arrangement of the dialogues. But judgments about the order of composition are often as subjective as judgments about Platonic authorship itself. in which case the total is indeed fifty-five. edition is underway) regularly present the Thrasyllan corpus in Thrasyllus’ order. Philosopher (Ithaca, N.Y.: Cornell University Press, 1991), pp. 46–47. direct and simple appeal to their authoritative status. These include Timaeus, Sophist, Statesman, Philebus, and Laws. Along with these philosophical developments, Plato’s manner of writing dialogues was evolving, too. complete chronological guide to the reading and teaching of the dialogues. in Ancient Philosophy, XII, ed. C. C. W. Taylor (Oxford: Clarendon Press, 1994), pp. 227–50. characteristic of the historical Socrates’ own philosophical conversations. Hippias, Ion, Menexenus, Clitophon, and Minos. follow from propositions that the other speakers have themselves granted. substance of Socrates’ own philosophizing, as Plato himself understood it. development. As I am using the term, it is a thematic classification only. during only one phase of his career as an author, whether early or late. group of late dialogues, the Socratic dialogues must predate all of these. content, in comparison with the contents of Plato’s other works. late dialogues Sophist, Statesman, and Philebus set out and employ at length. Thus Phaedrus, Parmenides, and Theaetetus all have clear forward connections to the late dialogues. group, it is not safe to rule out some chronological overlapping in composition. speaker in his own dialogues. of other genres. We know nothing substantial about them. dialogues written by some Peripatetics. they were handing down the truth. in thinking through the issues that he is addressing. teaching to memory instead of writing down on paper the words to be memorized! 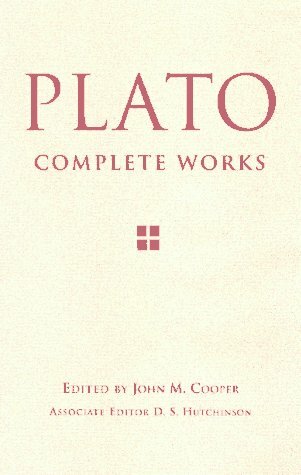 considerations as Plato’s reasons for never having written a philosophical treatise. do to engage a person effectively in the right sort of search for truth. speaker, one who establishes the topic of discussion and presides over it. such—both as the truth and as what Plato thought was the truth? speakers in each of the three groups. First, there is a matter of literary form that applies to all the dialogues. that I referred to above in drawing on what Phaedrus says about writing. the others as a means of countering certain sorts of resistance to them. lines, but the same applies in principle to all the Socratic dialogues. author speaks to us, not in the remarks made by the individual speakers. expressed by one or another of them. accept the skeptical interpretation of Plato’s own dialogues. his texts, and ourselves through them. far as possible be preserved or otherwise indicated in the translation. it must sometimes strain the powers of ordinary language. and studying these classics of Western philosophy. any errors or omissions in the footnotes rests with the editor. there we simply record the conjectured reading without further elaboration. nouns and adjectives that occur in the book. the introductory notes except those noted just below, signing them J.M.C. introductory notes to these fifteen works, signing them D.S.H. like to thank Rachel Barney, Christopher Bobonich, Panos Dimas, D. S.
Hutchinson, George Kateb, Alexander Nehamas, C.D.C. Reeve, J. B.
Kirklin gave steady, reliable, and invariably intelligent advice and assistance on all aspects of the production of the book. well as John Cooper, whose critical eye improved every introductory note. improvement of their earlier work. Gorgias, Meno, Greater Hippias, Ion, and Republic. Virtue, Demodocus, Sisyphus, Halcyon, and Eryxias. the text that appears in the Hackett edition of Statesman. Ltd., 1970. Reprinted with minor revisions, 1975.
of Liberal Arts, Bobbs-Merrill Co., Inc. Literature. Reprinted here by permission of Jackson P. Hershbell. just deposed murder charges against his own father for the death of a servant. on the excuse of business elsewhere. piety?’ and the other ‘What is . . . ?’ questions he pursues in other dialogues. among the questions this dialogue leaves us to ponder. you are not prosecuting anyone before the king-archon as I am? SOCRATES: The Athenians do not call this a prosecution but an indictment, Euthyphro. you are not going to tell me that you have indicted someone else. EUTHYPHRO: But someone else has indicted you? long hair, not much of a beard, and a rather aquiline nose. thing for a young man to have knowledge of such an important subject. his contemporaries, he proceeds to accuse me to the city as to their mother. likely to happen to one who started out this way. in the old gods, he has indicted me for their sake, as he puts it. be serious, the outcome is not clear except to you prophets. your case as you think best, as I think I will mine. SOCRATES: Whom do you prosecute? EUTHYPHRO: One whom I am thought crazy to prosecute. SOCRATES: Are you pursuing someone who will easily escape you? EUTHYPHRO: Far from it, for he is quite old. SOCRATES: My dear sir! Your own father? SOCRATES: What is the charge? What is the case about? do this, but of one who is far advanced in wisdom. EUTHYPHRO: Yes, by Zeus, Socrates, that is so. to piety and impiety are wrong, Socrates. in bringing your father to trial? I shall repeat the same challenge in court. him rather than about me. themselves in what they say about the gods and about me. the gods, and it is likely to be the reason why I shall be told I do wrong. which the majority has no knowledge. it is carried up to the Acropolis? Are we to say these things are true, Euthyphro? in prosecuting your father for murder, is pious. EUTHYPHRO: And I told the truth, Socrates. SOCRATES: Perhaps. You agree, however, that there are many other pious actions. actions pious through one form, or don’t you remember? is of that kind is pious, and if it is not that it is not. EUTHYPHRO: If that is how you want it, Socrates, that is how I will tell you. SOCRATES: That is what I want. obviously show me that what you say is true. impious. Is that not so? SOCRATES: And that seems to be a good statement? EUTHYPHRO: I think so, Socrates. enmity with each other. Has that, too, been said? EUTHYPHRO: We would certainly do so. would turn to measurement and soon cease to differ. hostile to each other whenever we do? EUTHYPHRO: That is the difference, Socrates, about those subjects. SOCRATES: What about the gods, Euthyphro? If indeed they have differences, will it not be about these same subjects? EUTHYPHRO: It certainly must be so. about these subjects, would they? and just, and hate the opposites of these? are at odds and at war with each other. Is that not so? gods, and would be both god-loved and god-hated. SOCRATES: And the same things would be both pious and impious, according to this argument? from each other on this subject. and say anything to avoid the penalty. of so agreeing do they nevertheless say they should not be punished? EUTHYPHRO: No, they do not agree on that point. done wrong, but I think they deny doing wrong. Is that not so? EUTHYPHRO: Yes, that is true, Socrates, as to the main point. unjustly. Is that not so? of this, I shall never cease to extol your wisdom. that all the gods hate such actions. EUTHYPHRO: What prevents us from doing so, Socrates? love, and the opposite, what all the gods hate, is the impious. it is being loved by the gods? EUTHYPHRO: I don’t know what you mean, Socrates. things are all different from one another and how they differ? EUTHYPHRO: I think I do. because it is being carried, or for some other reason? seen because it is being seen? something affected because it is being affected.2 Or do you not agree? something loved because it is being loved by them? it is being loved by all the gods, according to what you say? SOCRATES: Is it being loved because it is pious, or for some other reason? EUTHYPHRO: For no other reason. because it is being loved? being loved by the gods? that it is pious, but it is not pious because it is being loved. Is that not so? being loved because it is god-loved.